We could learn from this…..
We are part of the species called “Homosapien” so we are in fact animals. Some of our specie behave worse than some of our animal cousins but they do not inspirer me at all. 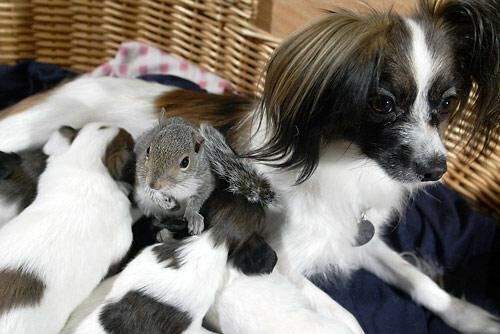 The great things about animals is they don’t discriminate. 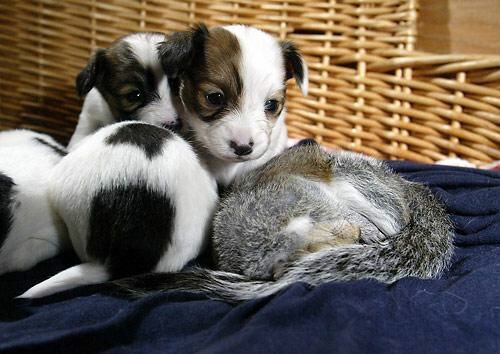 There is no racial, religious, sexual or sexual orientational discrimination in the animal kingdom. Except in our own species. I often wonder where did this learnt behaviour of dislike to others that don’t conform to our own narrow mindless come from ? I am not going to enter into a debate about what I think has caused this as thats now what this blog is about. What this blog is about is an email that was sent to me this morning from a friend. A heart warming email that made me think of the above. Why are we the only specie that discriminates against our own kind? I don’t have the answer to it and to be honest I don’t think anyone has the answer to this conundrum with an argument that holds water. I have attached the email for you too see and read. I hope it inspires you like it has done with me. 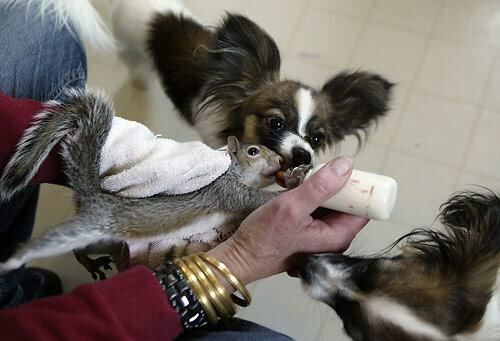 Debby Cantlon, who plans to release Glen, the young squirrel, back into the wild, bottle-fed the infant squirrel after it was brought to her house. 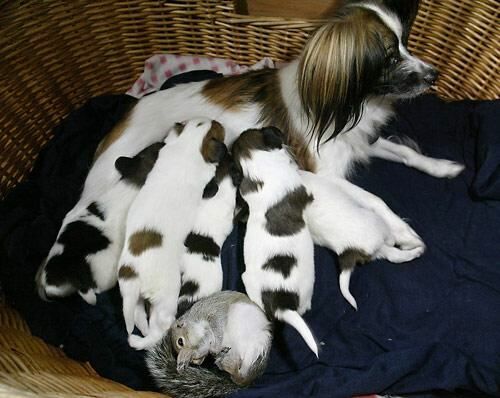 When Cantlon took in the tiny creature and began caring for him, she found herself with an unlikely nurse’s aide: her pregnant Papillion, Mademoiselle Giselle. 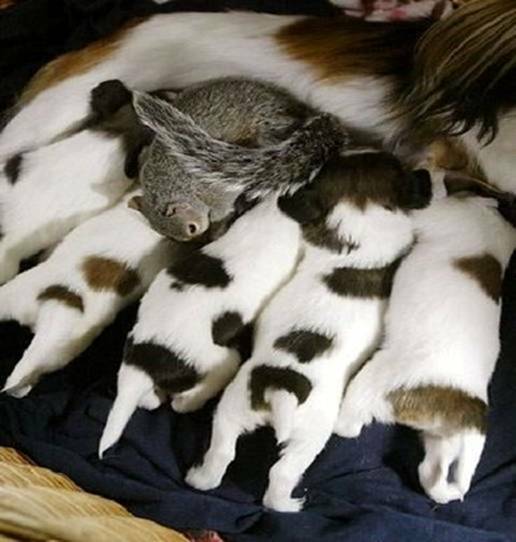 Glen was resting in a nest in a cage just days before Giselle was due to deliver her puppies. 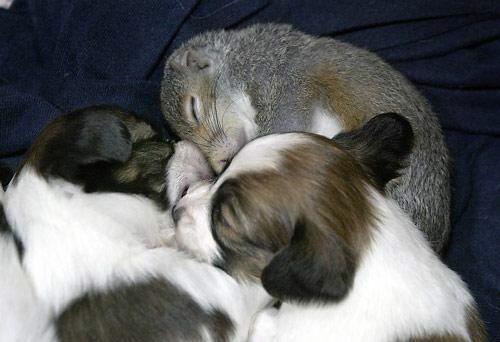 Cantlon and her husband watched as the dog dragged the squirrel’s cage twice to her own bedside before she gave birth. 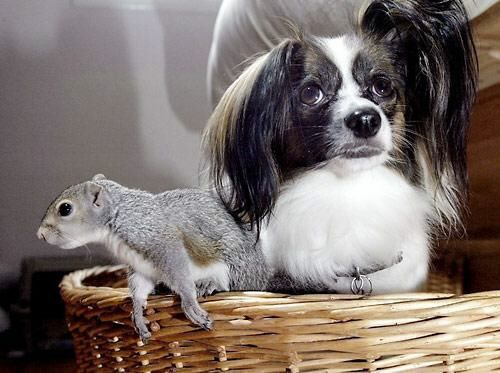 Cantlon was concerned, yet ultimately decided to allow the squirrel out and the inter-species bonding began. 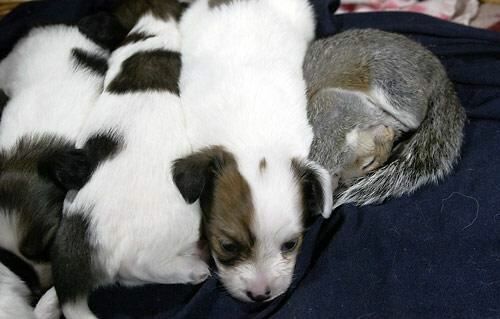 Glen rides a puppy mosh pit of sorts, burrowing in for warmth after feeding, eventually working his way beneath his new litter mates. Two days after giving birth, mama dog Giselle allowed Glen to nurse; family photos and a videotape show her encouraging him to suckle alongside her litter of five pups. Now, Glen mostly uses a bottle, but still snuggles with his ‘siblings’ in a mosh pit of puppies, rolling atop their bodies, and sinking in deeply for a nap. 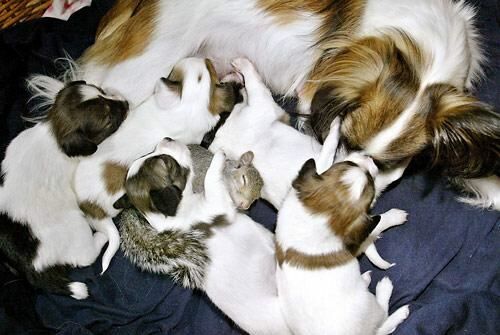 Glen and his new litter mates, five Papillion puppies, get along together as if they were meant to. Glen makes himself at home with his new litter mates, nuzzling nose-to-nose for a nap after feeding. We could all learn from this story. Why can’t we all be like Giselle and just get along with everyone and put our differences aside?